The eye catching display include 8 pieces of passional tire gauge, metal head and body, 4 side plastic bar. Metal head and body, 4 side plastic bar straight-on head for hard to get at valve. Plastic body, choice of colours, 2 side plastic bar. 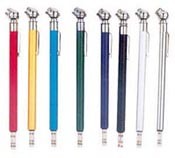 Plastic body, choice of colours with brass ring, 2 side plastic bar. Zinc cap head, brass tube, steel hook, high chrome plated finish, 2 side plastic bar, or a metal bar. B: Dual straight chuck, straight-on chuck with deep well lock onto valve mouth when fitted chrome plated finish.